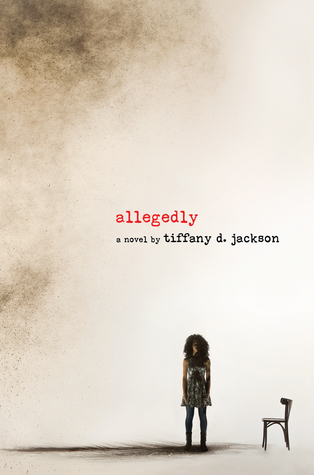 In this gritty and haunting debut, Tiffany D. Jackson explores the grey areas in our understanding of justice, family, and truth, and acknowledges the light and darkness alive in all of us. Allegedly is one of those books that you go wow, this is different. The minute I was reading, I was completely absorbed and Tiffany Jackson's writing is definitely A+ for me. Wow. If you are a fan of shows like Making a Murderer, this book will blow you away. I love the way the plot develops. I immediately feel for Mary. I don’t even care what she did, I just want to save her from her terrible conditions, which stops and makes me think. Wait of course I care what she did, allegedly!! It’s really interesting the way this book is able to play on different emotions. I also loved how Tiffany Jackson paired the present day narrative with different accounts and articles from when Mary was 9 and ALLEGEDLY committed her crime. As the story moves on we start to see more present day articles as well. Really this story is a rollercoaster of emotions. There were times that I thought one and times I thought the other. Little hints here and there to the real story that made you go hmmm. Some things I expected and some I did not but overall I couldn’t put the book down. This is one of those books that I absolutely do not want to spoil anything but I can say that the relationship between Mary and her mother is definitely one of the many focuses. It’s interesting to see how the way their interactions and experiences shaped Mary. You despise her mother but there are also tidbits and hints about her as well. It builds the big picture in the end. The reason Mary hooks up with someone is kind of similar to The Innocence Project is because she is now having a baby. She is concerned that they are going to take her baby away from her due to her past conviction and now she is going to do everything in her power to stop that from happening. This of course opens the can of worms that leads us down the rabbit hole of what is true and not true. Of course we see the very ugly side of group homes as well. The other girls are all in there for different reason and it’s interesting to also see their stories as well. Especially New Girl. So much I want to say! So much I can’t say! Ahh! My mind is still turning over Allegedly. I’ve told all my friends to read it because I just want to talk about it. It’s one of those books, I can’t stop thinking about it still. It leaves a lasting impression.